This is so much like an eighties slasher that it's surprising to find it was released in 1999. Camp Blood is clearly ripped off from the Friday the 13th series except the killer is wearing a clown mask instead of a hockey mask. There's a group of hapless teens on a camping trip, a crazy old man who warns them away and a machete wielding killer traipsing through the woods. The well endowed Ivonne Armant and her photographer boyfriend are the opening victims and the bodies pile up as the film wears on. It is obviously low budget but for slasher fans this paint by numbers genre flick ticks all the boxes. 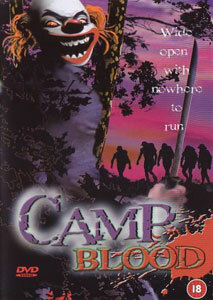 The colours are badly washed out, the direction is poor and the cast are annoying but you can have an enjoyable game of spot the cliché as Camp Blood limps over the hour mark and treats you to a hilarious nonsensical ending.